When, eighteen months back, we presented ‘The Edwardian Kitchen’ at East Sheen library, I showed a film clip of Gus Elen singing ‘Arf A Pint of Ale. 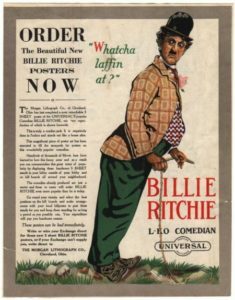 This had prompted a member of our audience to ask whether it had been Gus Elen who had learned that distinctive walk from Charlie Chaplin, or Chaplin who had learned it from Elen. I frankly wasn’t sure (there are no early film records), but conjectured that it had been Chaplin who had been inspired by Elen, nearly 30 years his senior. Chaplin was known to be an admirer of Gus Elen. As a five-year-old, Chaplin had delighted the audience Canteen Theatre in Aldershot with an impromptu rendering of Gus Elen’s ‘E Don’t Know Where ‘E Are. There is certainly a great deal of similarity between Gus Elen’s stage walk and that of Charlie Chaplin. But they are not identical. Elen’s is the cocky swagger of the cheeky costermonger; in Chaplin it becomes the gangly gait of the down at heel little man in the ill-fitting suit and shoes. “I first used my present make-up in my vaudeville act with my three sisters in 1887 […] Two years later I again used the same make-up in the character of the street musician in ‘Early Birds’ while with the Karno company. I claim that I am the originator of this make-up and of the comedy that is associated with the make-up” (in Motography: The Motion Picture Trade Journal). It is “Chaplin’s walk” that would be remembered. What today is less well remembered is that his distinctive walk inspired popular songs of the day. Below left is Nat Ayer’s That Charlie Chaplin Walk; below right, Henry Fay’s They All Do The Charlie Chaplin Walk, both from 1915. 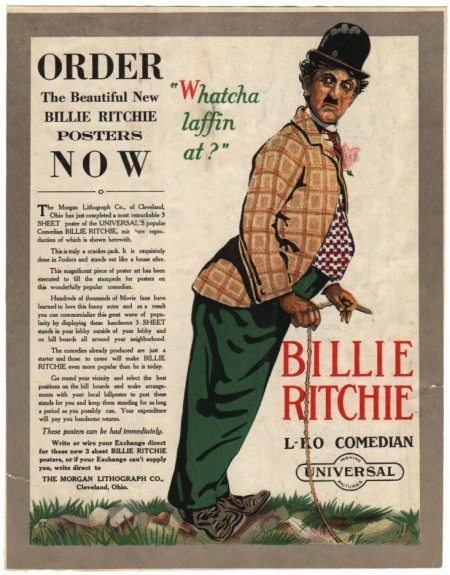 There seems little doubt that Billie Ritchie provided the inspiration for Charlie Chaplin’s character. However, Gus Elen may have influenced Charlie a little more than is suggested here. Gus Elen’s walk which can be seen on the short film, is a stilted version of that used in his usual stage act. This was due to the fact that a fixed camera in a booth was being used, which necessitated the performer undertaking very limited movements in order not to stay in shot. A late post, I know, but have only just stumbled across this interesting website. Thanks so much for the comment, Peter. I know Chaplin was a huge admirer of Gus Elen, and so had guessed that he’d assimilated a lot from him. I’ve just never been sure how much. My comment should have course read “… in order to stay in shot”. It seems likely that Chaplin absorbed various aspects of Elen’s work, as Gus was both a popular and influential character, and as you say, the young Chaplin was an admirer. I can’t say how much Chaplin took on board, but it would be good to imagine that he saw Gus as a role model if nothing else. They certainly shared traits that led them to star status, and to introduce social commentary to their work.